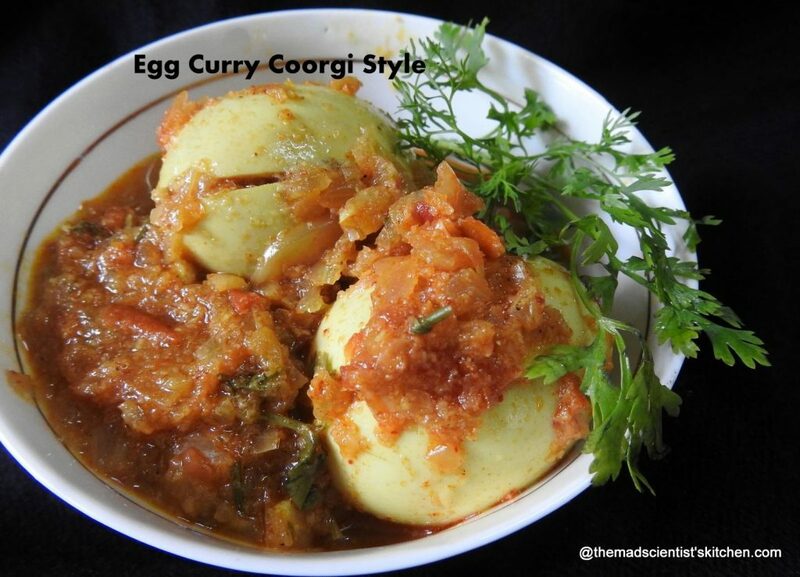 Egg Curry cooked in Coorgi style is an adaption of Chicken Gravy Coorgi style. Cooked with minimum spices we enjoyed it when we went to live at this homestay called Ashania run by Mr &Mrs. Prasad. Mrs Prasad shared recipes that she made for us and I am finally trying to pen them down. My mom as a kid had lived in Coorg, Madikeri and she shared many fond memories. Coorgi wedding according to her was a treat to watch and participate in. She and her brother, strict vegetarians, used to tell us stories about how the crabs were roasted in the fireplace that was used to heat water. How the pepper grew and how the coffee there tasted the BEST! In short, I grew up wanting to be a part of this beautiful place, the traditions and their food. Therefore, last year we went as a part of a trek and since I could not participate in trek as I was not in good health we visited separately. The girls had their list of places to visit and we had ours. The two days spent there were the best holiday we had. In case you visit Coorg be sure to visit the monastery it is a beautiful place and the Vegetarian momos you get there are amazing. Do not forget to stock up on chocolate either. When you are there do visit Dubare, the elephant camp. There are strict timings so do check and visit. On the way, we came across a Café called Big Cup they sell amazing coffee the best Arabica you can get. Hmm looks like we should visit again. We ate this as a chicken dish I have made it with eggs. You can substitute with mushrooms, paneer or even the humble potatoes. Only adjust the spice levels as per taste. 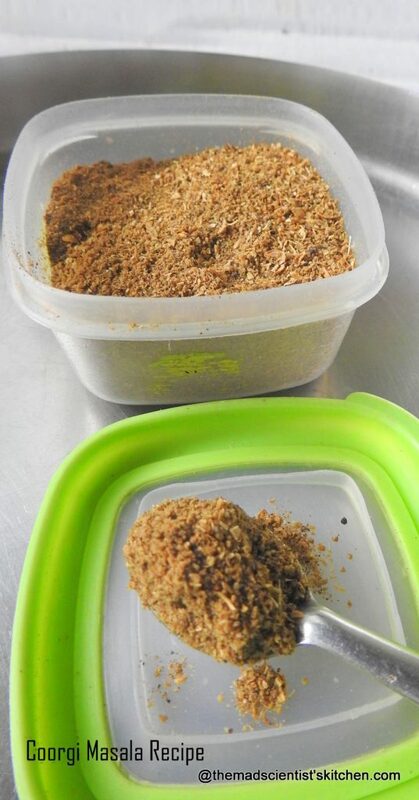 There is a special Coorgi masala that you can check out here. The main ingredients are boiled eggs, onion, tomato and the Coorgi masala. 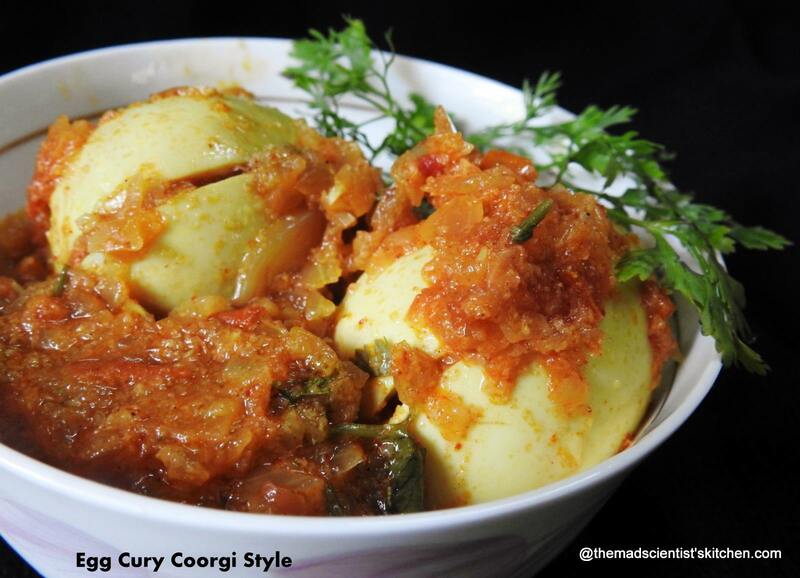 A mildly spiced egg curry made in Coorgi Style! In kadhai/wok heat oil, add the finely chopped onion, tomato and salt cook till the onion and tomato soften. In case you are using chicken, add the washed and chicken made in small pieces. Cook covered with the onion and tomato until the chicken is soft. Meanwhile grind all the ingredients under to grind to a fine paste. Slit the eggs on the opposite sides but keep them intact. In the kadhai/wok of softened tomatoes and onions add the eggs and mix well. Add the ground masala, salt and mix gently. Adjust the consistency and the seasonings. I needed more chilli powder. Mix the lemon juice and sserve hot with steamed rice or rotis. Now will have to find what is coorgi spice is . Ya Coorg is beautiful and it is on our list the next time we visit Chennai. Nice reading about your coorg vacation..just read about the Coorgi masala you wrote about..let me try that sometime! That’s for that coorgi masala recipe as well. This sounds delectable and loved reading about coorg. Need to visit sometime. 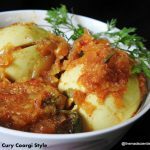 I have heard a lot of coorg stories during my Bangalore days and about their wedding and dressing .it is totally different.. Of course their cooking is also unique.. Love this egg masala..
Slurp slurp, and this coorgi masala sounds absolutely delectable, would love to have with some rice. One of my friends is from Coorg and they have amazing recipes. I saw a documentary on Coog cuisine and found their exotic ways of cooking and the coffee plantation. Will have to find out what corgi masala is. Addition of spices in varying amounts makes all the difference to curries. Mildly spiced is what I like. Egg curry looks so perfect and delicious. Nice read about your coorgi vacation. Though I have been to Coorg, havent heard about this coorgi masala. Love this egg masala.